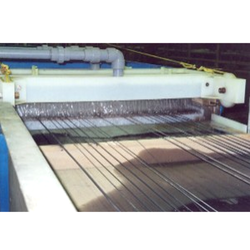 Leading Manufacturer of fumeless pickling wire lines from Ghaziabad. The High Turbulence acid section represents the latest development in acid cleaning technology. The carefully designed flow patterns effectively break down the boundary layer pocket of spent acid adjacent to the wires, thus continuously supplying fresh acid to their surface. Pickling speed is further increased by the effective scrubbing action of the turbulent acid flow. In keeping with nowday’s energy conservation concerns the acid section is designed in a series of modular stages, with each section having a separate optimally sized corrosion resistant pump, turbulence tray and re-circulating loop. The multiple stage design allows for lower acid consumption, by the efficient "stepping" of acid concentration levels. The modular system also ensures a lower spare parts inventory cost and eliminates the need of costly back-up pumps.